Screen saver is executable that has file type *.scr and sitting in system directory. It is windows program that terminates self when user take some action like pushing the keyboard button or moving mouse. The animating part may be totally independent from windows part and can be done in different ways. The suggested is openGL, as the most convenient. The only part that require special attention is how to make screensaver available for a preview than means showing itself in a preview window. The solution can be seen from the code. 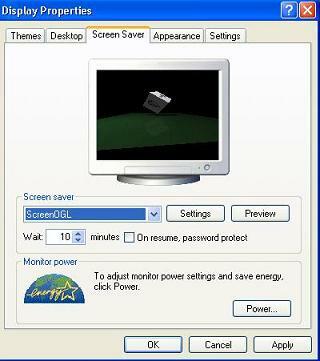 This screen saver is written as simple windows program combined with OpenGL graphics. The windows part is elementary. The concept of this program is isolation of windows part from the graphical GL part. In this project they are almost independent and even sitting in different files. The name of this function is passed as parameter to a structure WNDCLASS in the WinMain function. This is basically a big picture how windows part works. The example of this screen saver can be used as template for funnier and better graphical part without significant or any change in the windows part.